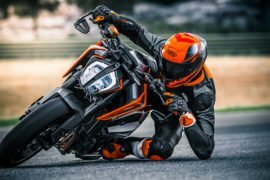 KTM, the renowned Austrian bike manufacturer, has revealed the new 790 Duke at the 2017 EICMA motorcycle show in Milan. The new street-naked will even give birth to an adventure motorcycle in near future. 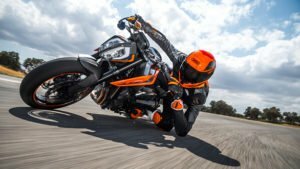 The company is promoting the new KTM Duke 790 as the ‘ultimate street weapon’. This is the first-ever motorcycle from the company to boast a parallel-twin engine. While there’s nothing official about the new motorcycle’s India launch prospects, the product is likely to rival the likes of Triumph Street Triple S and Kawasaki Z900. The D790 is still in a pre-production stage. However, a mid-2018 launch in European markets looks very likely. KTM Duke 790 India debut is likely to take place at the Auto Expo 2018. Well, nothing is official at the moment. However, speculations abound that the new Duke will become the flagship offering in the country. It will be brought to the country via CKD route and assembled at the company’s Pune facility. The new motorcycle might be here by the end of next year. Currently, the motorcycle is in a near-production stage and will launch in its home market by mid-2018. Don’t be too surprised to see the India debut of the Duke 790 at the Delhi Auto Expo 2018. While the official price list will be available at the time of the launch, we are pretty sure it will cost roughly Rs 8 lakh. In company’s global product portfolio, the new motorcycle will find itself positioned between the Duke 690 and the Duke 1200. This bike will come to India via CKD route. It will be assembled at the company’s facility in Pune. The new Duke 790 becomes the first-ever motorcycle to sport a parallel twin-cylinder engine. Internally, at KTM, the new engine is known as the LC8c. The ‘c’ in the name stands for compact. The new 799cc parallel twin-cylinder engine outputs a maximum power of 103.3 BHP at 9,000 rpm along with a peak torque of 86 Nm at 8,000 rpm. The engine gets two balancer shafts to keep vibrations under a check. The motor comes mated to a 6-speed manual transmission that sends power to the rear wheel thru a chain drive. 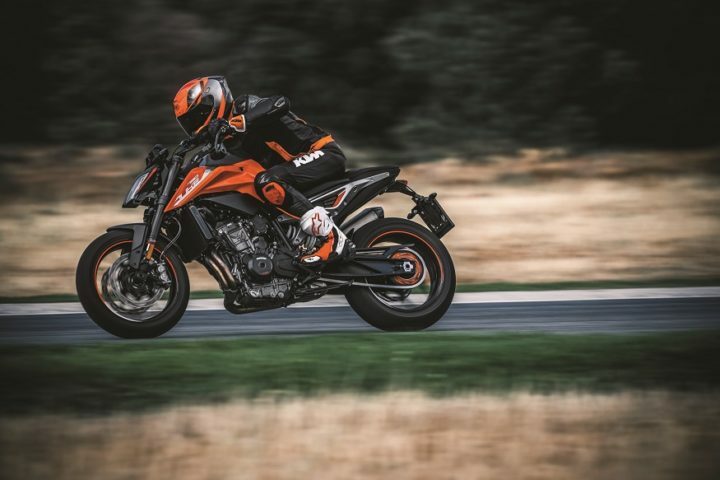 The new motorcycle offers multiple riding modes, which include a customizable Track mode.In words of the marketing team at the Austrian company, the new KTM Duke 790 offers “unparalleld poise, telepathic levels of feedback and lightness that’s off the scale”. The latest motorcycle from KTM comes with 43 mm WP split-function Upside Down front forks along with a gas-charged monoshock at the rear. The front wheel gets twin, 300 mm disc brakes with four-piston, radially mounted callipers. The rear wheel has a 240 mm single-disc with a two-pot calliper. Also, the latest bike from the company offers a Bosch-sourced Anti-lock Braking System (ABS) as a standard feature. There’s also cornering ABS on offer. The Duke 790 you see in the images here is in its pre-production form. However, it doesn’t look like the production-spec KTM 790 Duke would look much different from the model that has been put on a show at the EICMA 2017. As can be easily made out, the bike seems to share in plenty with some of the bigger Katooms out there. For example, the headlamp looks a lot like the one on the 1290 Super Duke R. Some highlights of the package include WP steering damper, ride-by-wire throttle, single-seat, multiple rider modes, multi-level traction control, IMU, and smartphone connectivity. Other important features available on this motorcycle are – Full-colour TFT instrument console, lean-sensitive traction control system, launch control, quick shifter and My Ride system. The new KTM motorcycle is built around a lightweight steel frame. 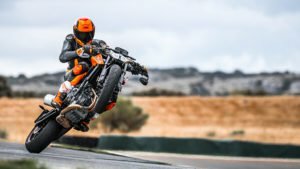 The 790 Duke tips the scales at 169 kgs. So, what are your views on the latest motorcycle from KTM? Are you waiting for the new KTM Duke 790 India launch? Do share your views by penning them down in the comments section below. Also, stay tuned to Carblogindia for latest news on cars and motorcycles relevant to India.